I’m not much of a breakfast person on weekdays. Usually I’m too busy getting ready for my day to fuss much with food and a cup or two of coffee is about all my stomach wants early in the morning. But the weekends? They are all about breakfast. Weekends should be full of pancakes, French toast, omelets, and Sausage with Dried Blueberries. Never heard of sausage with Dried Blueberries? Well I hadn’t either until I discovered it in my very favorite Southern Cookbook, Tupelo Honey Cafe: Spirited Recipes from Asheville’s New South Kitchen . I absolutely love this cookbook and I’m thrilled that they are coming out with a second cookbook early next year. If you’re not familiar with Tupelo Honey Café, it’s a restaurant in Asheville, NC that seems to be spreading all over the South. There’s now one in Greenville SC, Knoxville TN, Johnson City TN, one opening in Chattanooga and another one coming to my hometown Charlotte NC! The cookbook is full of delicious recipes that really work in the home kitchen. So many restaurant cookbooks fail to produce recipes that work for the home cook and that can be disappointing . But this one really delivers with the recipe for their famous Sweet Potato Pancakes with Peach Butter and Spiced Pecans, their Grateful Dead Black Bean Burger, Smoked Jalapeno Glazed NY Strip Steak with Tomato Shallot Gravy, And Fried Green Tomatoes with Goat Cheese Basil Grits. 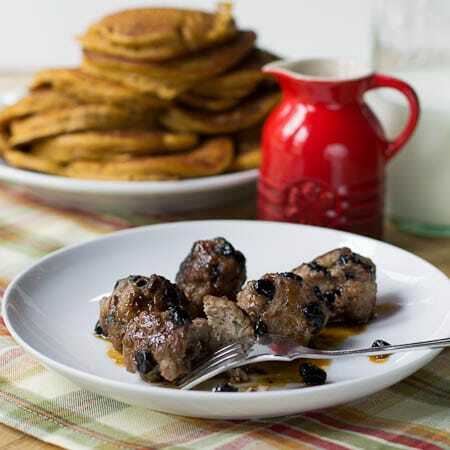 But back to Breakfast Sausage with Dried Blueberries, which in the cookbook is called Pork and Blueberry Sausage simmered in Maple Syrup. It may sound a little strange, but it is the perfect combination of sweet and savory. I had been looking for a unique recipe to use dried blueberries in since I received some of the most plump and delicious dried blueberries from Oh! Nuts. Check out their selection of dried fruits and nuts. They are top quality and come packaged in fantastic resealable bags. I changed the recipe up just a little, slightly decreasing the amount of dried blueberries (there were still plenty) and adding some red pepper flakes. I like my spice! They strained the maple syrup before serving it over the sausage balls, but I didn’t see any reason to strain it and just served it directly from the skillet. For the pork sausage I used a pound of bulk sausage from my local butcher. If you purchase ‘hot’ bulk sausage, I wouldn’t add in the red pepper flakes. 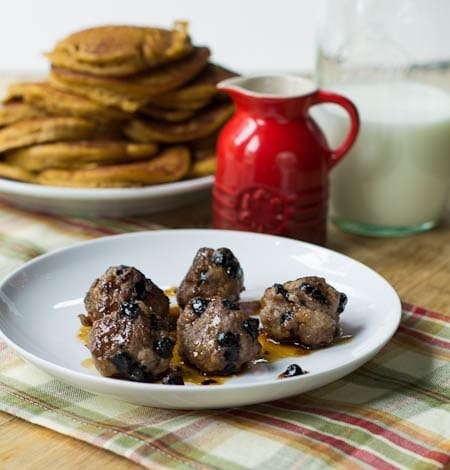 These sausage balls go wonderfully with some pumpkin pancakes! 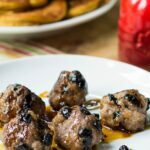 Sausage takes on a sweet and savory form when mixed with dried blueberries and simmered in maple syrup. 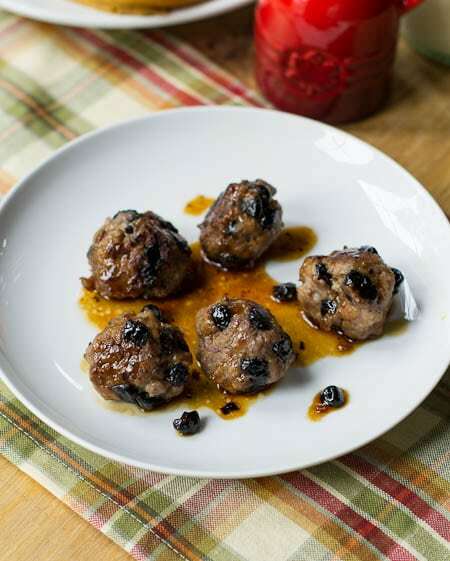 Mix sausage, blueberries, and red pepper flakes together and form into 1 1/4-inch balls. 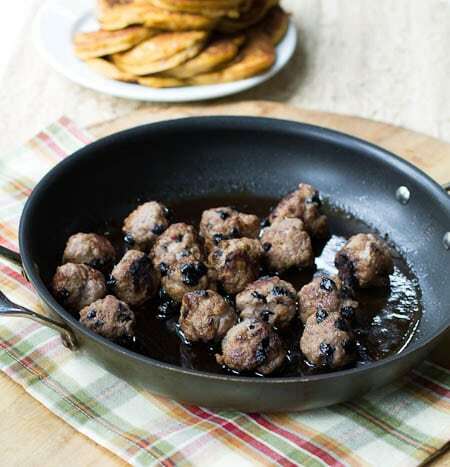 Place sausage balls in a large nonstick skillet and cook over medium heat for 6 to 7 minutes, turning every now and then to brown all sides. Add maple syrup and bring to a simmer for 1 minute. Roll the sausage balls around to coat all sides in syrup. Serve sausage with maple syrup drizzled on top. This entry was posted in Breakfast and tagged blueberries, Breakfast, Oh! Nuts, Pork, Sausage. Bookmark the permalink. The OMNI hotel in Austin, Tx serves these- they are my favorite but they seem to run out all the time. Now I make them at home and they are just as yummy. I cut the maple syrup quite a bit (since I am diabetic) and they still came out great!! I’ll have to remember that next time I am in Austin! They really don’t need much maple syrup do they, especially since the blueberries already add sweetness. The next time I get some dried blueberries, I am going to be all over this recipe! I’ve never heard of this, but I want some! It sounds just delicious with that spicy sausage and those sweet blueberries. Great idea! Me too Matt! Probably my favorite part about weekends! What an interesting combination of flavor for breakfast sausage. I’m intrigued and love the idea of dried blueberries. YUM! 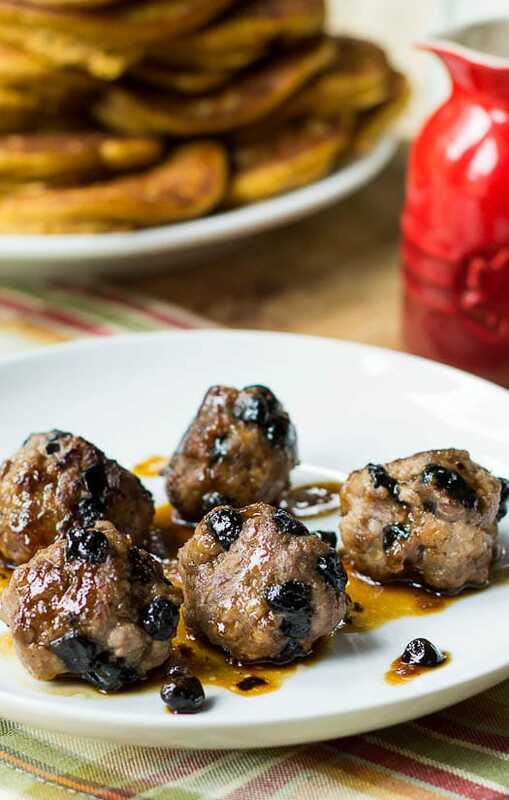 Holy Cow, Christin, what a wonderful idea to blend the dried blueberries INTO the sausage! Brilliant! Both my husband and I devour blueberries for breakfast! Thanks for the idea!